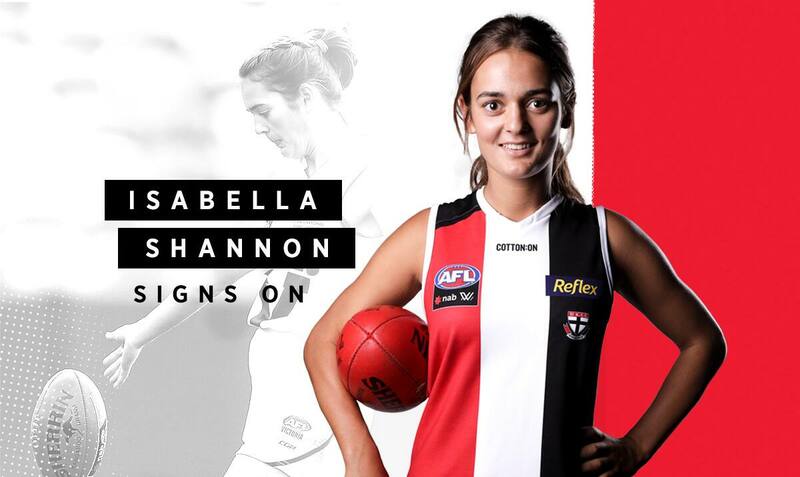 St Kilda has secured yet another young talent in Isabella Shannon ahead of the 2020 AFLW Season. I can’t explain it really, it was surreal. I just didn’t think it was happening. St Kilda has secured yet another young talent ahead of the 2020 AFLW Season, with Isabella Shannon officially becoming the third player to commit to the red, white and black. A half-forward with the ability to run through the midfield, the 17-year-old will be another prized asset to the Saints as they enter their inaugural year in the AFLW. Shannon now joins Ali Brown and Molly McDonald on St Kilda’s official list, with the trio forming the foundation of what will be a promising, youthful side. “I can’t explain it really, it was surreal. I just didn’t think it was happening,” Shannon told saints.com.au about her deal with the club. The Dandenong Stingrays product has played just four seasons of football for Balnarring Junior Football Club and Mt Eliza, but has shown substantial ability to warrant her signing from St Kilda. St Kilda’s AFLW coach for 2020, Peta Searle, was glowing in her assessment of Shannon, praising the youngster’s attributes and potential to become a cornerstone of the club. “Isabella’s hardworking, she’s pretty driven and she’s got great athletic ability which we’ve always known, but that’s even gone to a new level,” Searle told saints.com.au. Taking out the Stingrays’ goalkicking honours last season with 11 majors from nine games, the newly-signed Saint has the makings of a key position forward at the elite level. Such qualities enabled Shannon to be invited to train with the Southern Saints, before she was ultimately signed to St Kilda’s AFLW team. St Kilda’s Head of Emerging Football Programs, Jamie Cox, was the one to break the news to Shannon, who in turn had to endure the agonising wait of school to finish before she could finally be told she would be a Saint in 2020. “I was at school and I got a text from Jamie, and because we’ve got a no-phones policy I had to quickly check it in the toilets and it said ‘can you ring me after school?’,” Shannon said. Like many female footballers, Shannon’s career and rapid growth began unrehearsed, with her junior days at Balnarring the product of encouragement from her dad. “I’ve always been into sport and I played netball for ages, and I just kicked the footy with dad and my brother when I was younger,” Shannon said. Since then, Shannon’s prowess has been continually growing, with the gifted Saint poised for an impressive 2020 should her form carry onto the big stage. “With the way the game’s played at AFLW, she certainly has all the hallmarks,” Searle said. She’s got the physical attributes and her footy is certainly good enough. If she keeps on the trajectory she’s shown in the last six months, she’ll become very valuable for us." As well as juggling her football commitments, Shannon has the added responsibility of being College Captain of Padua College, alongside her demanding Year 12 studies. Such leadership qualities will hold Shannon in good stead as she embarks on her journey into the AFLW. “I guess now that I know I have what it takes, I can put in a good season and work hard, get the skills up to scratch and then focus on playing AFL footy next year,” Shannon said.